Last week I made a little day trip down to Indianapolis to do some decorating with my sister…Can you imagine a day more fun than that?! 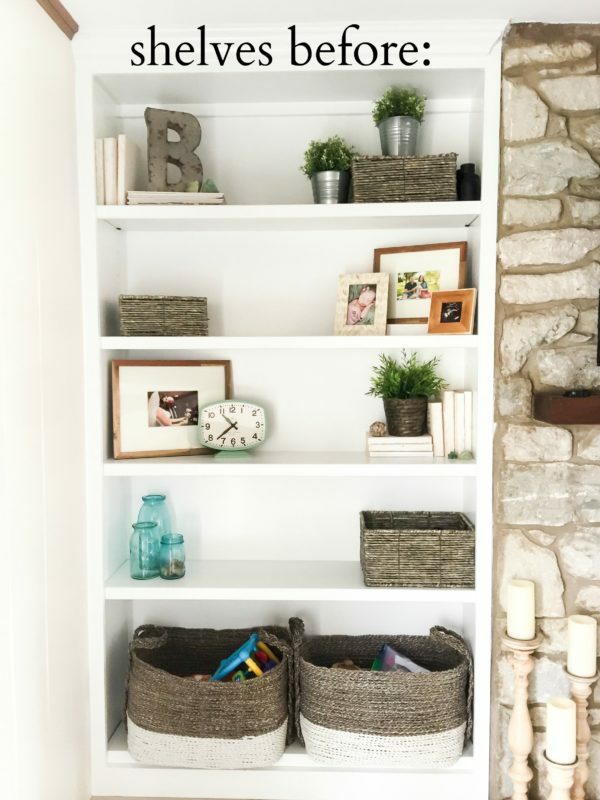 She and her husband bought and renovated their home about a year and a half ago, and she wanted to focus on decorating some of the areas in her house that were still, well, undecorated. The area we chose to focus on on that particular day was the open shelves next to her fireplace. 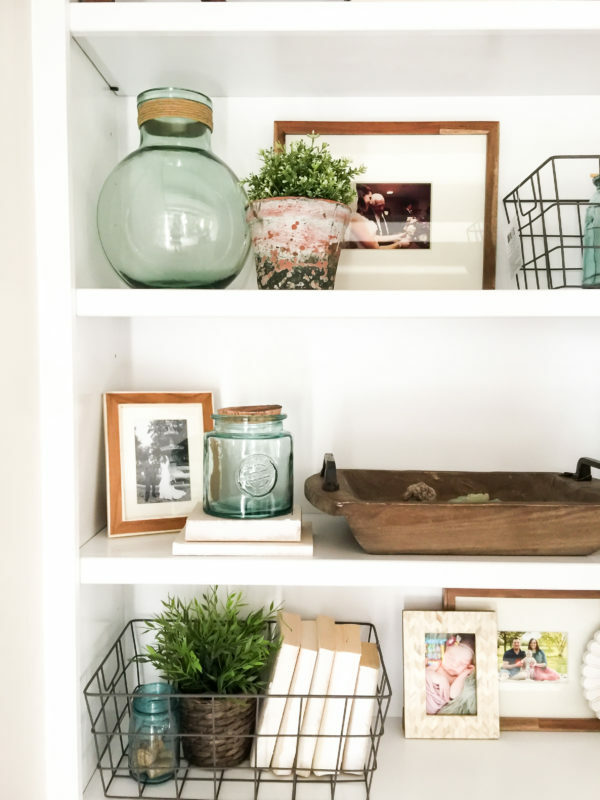 Open shelves can be tricky, so I thought I’d share with you how to style open shelves for an uncluttered look. 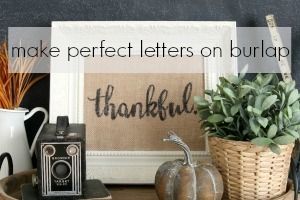 * Sources for most of the items we used to decorate are at the bottom of this post! Here is a look at the shelves before we began. These shelves are removable and adjustable, and I had actually already suggested that she remove one of the shelves before I took this picture. Before she removed one of the shelves they were too close together, which really limited what we could do with them. After she took one of the shelves out (as you can see below) we now had more height per shelf to work with. My sister already had enough smaller pieces, so my goal was to incorporate some larger accents (like the wood corbels, wire baskets, blue vases, and wood dough bowl to fill the space. If you use too many smaller decor pieces, it ends up looking junky and cluttered. 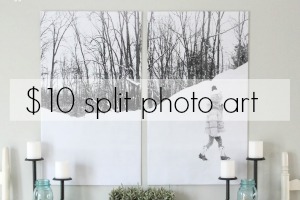 By using larger pieces, you fill space without things looking too cluttered. Balancing decorative pieces of various sizes is good. Repetition is good. I repeat, repetition is good…ha! No, but really, repetition is good. Notice the way we used a corbel on top, and repeated it on the bottom opposite corner. 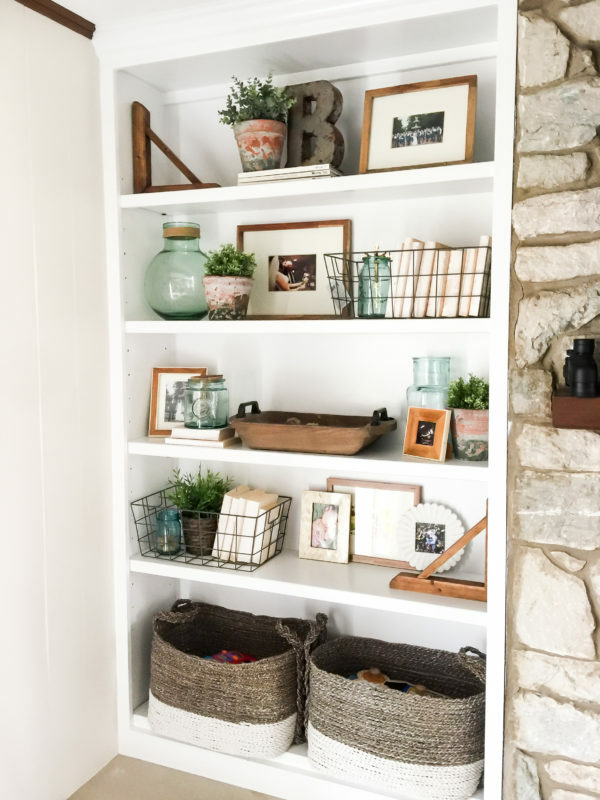 We repeated blue vases, wire baskets, aged terra-cotta pots, coverless paperbacks, greenery, and wooden photo frames….that is a lot of repeating! 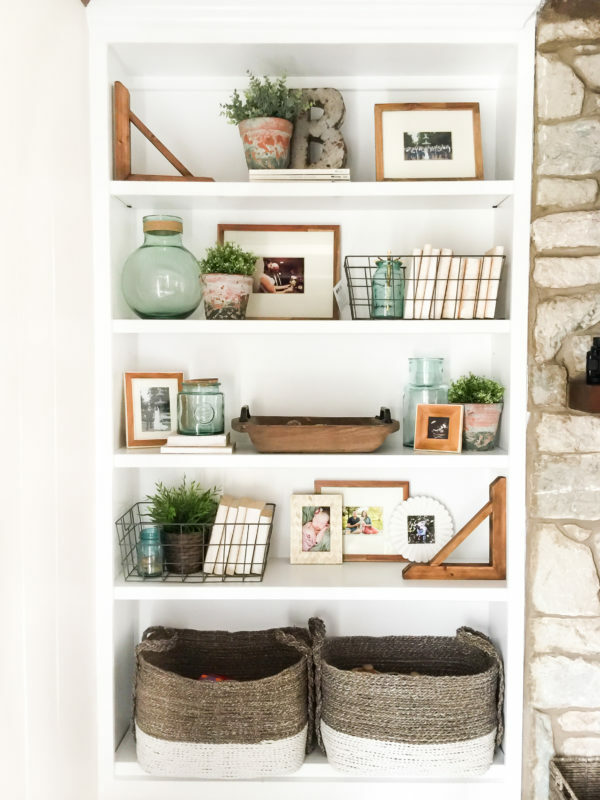 Not only do you want to repeat decorative accents to avoid your opens shelves from looking cluttered, but you also want to repeat elements of color and texture. We focused on using blue colored vases for pops of color, aged terra-cotta planters for texture and color, and wooden elements to create a repeated color/texture. By repeating decorative accents and elements, we create a harmonious and uniform look from top to bottom. One of the fundamental rules of decorating is using groupings of three. The eye likes threes…it just does. Creating little vignettes and groupings of three is just an easy way to make your eyes happy. Let’s make this like a game: How many groupings of threes can you spot in the open shelving below? If you want to save these tips for later, be sure to pin! hey girl- love the shelves! so cool! I have some shelves that desperately need some styling, and you have given me LOTS of great ideas! I love your guidelines. You have now broken it down for me so it is manageable! Thank you so much!! Plus i LOVE shopping at Hobby Lobby and Target! Thank you for your post. I need some advice. We have 2 sets of open shelves, similar to the one here on this post, but with a long bench between them. So should both sets of shelves be the same for decor? 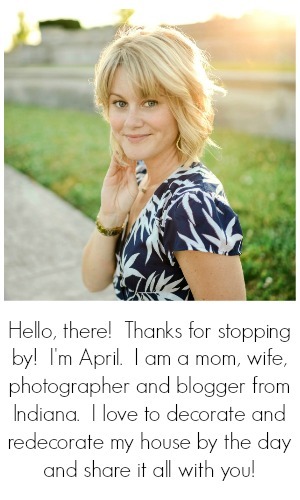 Hi April, This is my first visit to your amazing blog. I’m not sure how I arrived here, I started out on Pinterest and one click led to another. But, I am sure I was supposed to find you today. We have floor to ceiling open shelves (built-ins) on 2/3 of one wall in our den. I haven’t been happy with my styling of the shelves for a long time, but every time I tried something different, I disliked them just as much or more. Yesterday afternoon I took everything out of them except a clock (my only loved item on them) and put it all into 3 large storage boxes, hoping if I left them empty for a while I might get a burst of inspiration. When I walked in there this morning, the blank expanse was overwhelming and my hope from yesterday was already withering. Until now! My hope is renewed, your advice, ideas and photos have inspired me, I thank you and look forward to following your blog! Thanks so much for your post! 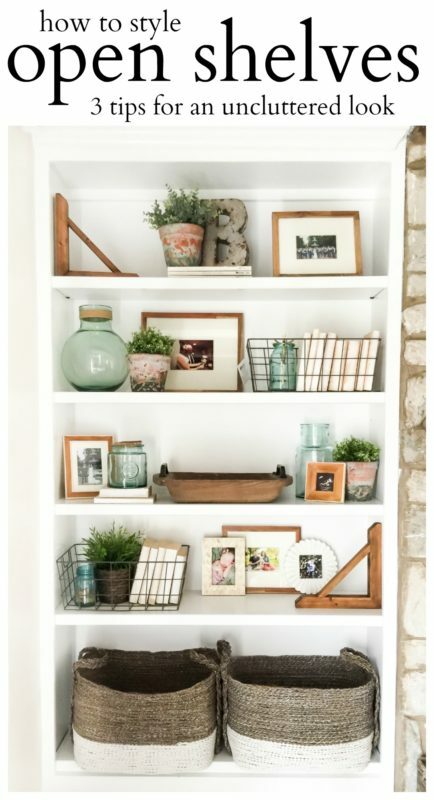 This is just the inspiration I need to finally purge a few things and make my floor to ceiling white shelves pop. Where did you Prichard the two baskets on the bottom shelf?